Shutting down his recruiting quicker than most anticipated, 6-5 2018 guard David Singleton (Bishop Montgomery/Torrance CA) has committed to UCLA. Singleton unofficially visited UCLA last Tuesday where he received an official offer from Bruin head coach Steve Alford. 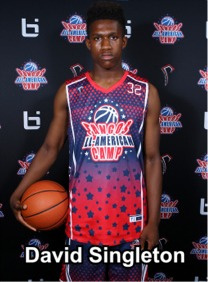 David also received offers from the likes of Arizona, Gonzaga, Oregon, USC, Arizona State, UNLV and UConn. Singleton was a pivotal figure in Bishop Montgomery winning CIF Southern Section and State Open Division titles this year defeating top squads like Sierra Canyon, Mater Dei (twice) and Chino Hills in the process. Last year Singleton was selected to the Pangos All-American Camp Top 25 Game and named all-tourney at the Las Vegas Fab 48 and Terrific 24 tourneys. David is also an excellent student, sporting a 3.8 GPA.